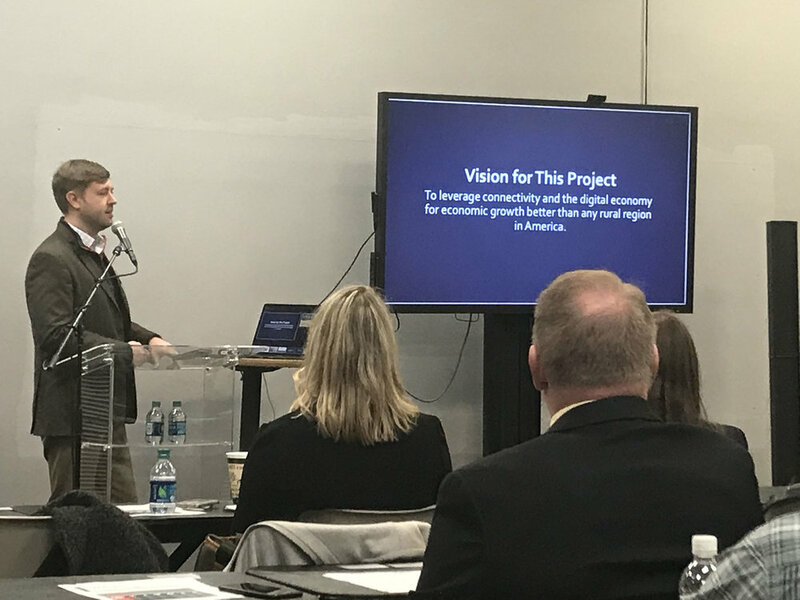 Jared Arnett, executive director of Shaping Our Appalachian Region, Inc. (SOAR), spoke at an Economic Development Workshop hosted by one East Kentucky on Tuesday, January 22 at the Mountain Arts Center. Arnett gave an overview of SOAR’s Regional Blueprint for a 21st Century Appalachia, and the importance of this framework as it relates to community and economic development efforts. Jared Arnett, executive director of Shaping Our Appalachian Region, Inc. (SOAR), spoke at an Economic Development Workshop held by One East Kentucky on Tuesday, January 22 at the Mountain Arts Center in Prestonsburg, Ky.
SOAR’s Regional Blueprint has seven goals. At the core of the goals is broadband connectivity. The other six goals, as Arnett said, “is what we are going to do with connectivity.” The other goals are: workforce, small business, healthy communities, industrial development, regional food systems, and regional tourism. Arnett also highlighted SOAR Innovation, a new partnership with the Kentucky Cabinet for Economic Development’s KY Innovation Office. SOAR Innovation will specifically target small businesses that have the capacity and desire to scale-up, expand markets, and/or create new markets by utilizing technology. It will also provide assistance to entrepreneurs who have a desire to open a business and reach expanded markets through technology. SOAR Innovation will have offices throughout Appalachia Kentucky, and Business and Innovation Champions will work to build relationships with existing small businesses and entrepreneurs and work to connect clients with a vast toolkit of services provided by SOAR partners. One East Kentucky, a Blueprint Partner of SOAR, is a regional organization representing nine counties (Floyd, Lawrence, Johnson, Knott, Letcher Magoffin, Martin, Perry and Pike counties) that recruits industry and investment into the region. For more information on One East Kentucky, visit http://www.oneeastky.com/oek.